This is a quote everyone should remember when throwing an event. Whether it be a social gathering or a corporate event, food is the primary factor that drives networking and helps people socialize. Food can be one of the largest expenses of an event. But, if done right, it can also be the main attraction as well. Some food items are so important that they’re symbolic of certain holidays. For example, turkey with Thanksgiving, cakes with Christmas and caramel apples with Halloween. As far as corporate events are concerned, food plays a vital role in encouraging connections and building relationships. Let’s find out how. For a good conversation to happen there needs to be something in common between the guests. Food solves this problem by acting as an ice-breaker. Delicious cuisines and unique food items are the best conversation starters. It helps people come out of their comfort zone and become open to new experiences. A corporate event involves a gathering of people with different departments, jobs, food choices and tastes. Some of these people may never meet outside of a corporate event. Food stations at corporate events encourage networking by letting people meet and communicate based on their tastes and food preferences. This can leads to the building of strong relationship between individuals who would’ve never met if it weren’t for their common interest in food. A day full of meetings and speeches can make the workplace feel dull and boring. In this case, some snacks can reenergize your workforce. Attendees that are full of energy and enthusiasm contribute a lot in making the event a successful one. To keep the energy level high, it is important to keep everyone well-fed. Bring everyone under one roof and let good food handle the rest. Not everyone attending your corporate event will remember your company’s achievement, prospective growth plans and long speeches. But, one thing that will stick in their minds will be good food. Unique cuisines, on-time service and the creative presentation of food stalls will make a lasting impression. 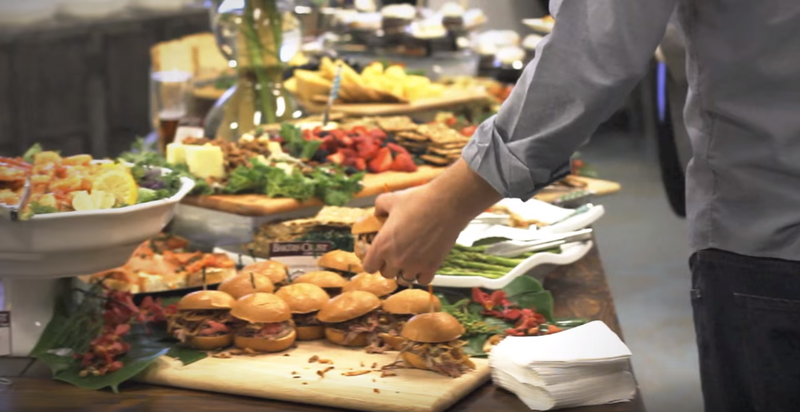 Food helps attendees in socializing easily at a corporate event. It also plays an important role in establishing long term relationships. Next time you plan for a corporate event, remember to focus more on good food to make the event a successful one.